Formerly known as the Royal Amazon Lodge, the Agua Boa Amazon Lodge is located on a small clear water tributary of the Amazon perfectly suited for peacock bass. The Agua Boa is a crystal clear with a white sand bottom. Imagine a small river flanked by Varzea flood forest and Gallery forests still in pristine shape with all of its great wildness still intact. The crowns of many of the hardwood trees in the Gallery forest reach heights of 200 feet and all of the species are still present. 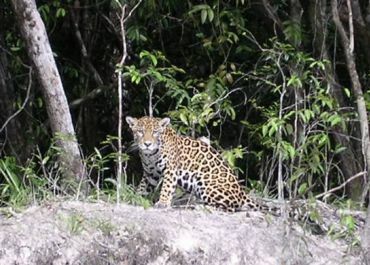 It is not uncommon to find beaches filled with the tracks of the endangered Amazon River turtles, tapir and even jaguar. Nothing could be more spectacular for an angler than the return ride to the lodge after a great day of fishing through meandering bends of this great watershed as the forest comes to life each evening. The Agua Boa Amazon Lodge is located on a quiet stretch of the Agua Boa river. At the lodge, clients are attended by a friendly Brazilian staff. We have kept the size of the lodge small to afford anglers a great expanse of fishing water and to insure that the atmosphere at the lodge is a pleasant one. 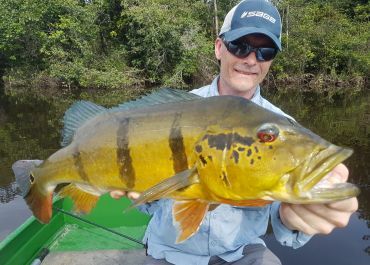 For those of you that have traveled on houseboats with 14-20 bass fisherman crammed into a small space, the attraction of the Agua Boa Amazon is an obvious one. 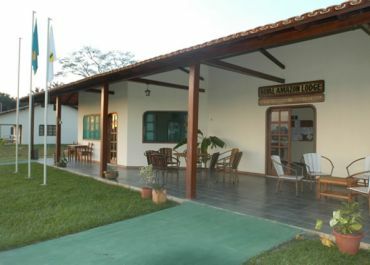 It is the small family atmosphere and sheer elegance of the lodge that have made the Agua Boa Amazon a success. 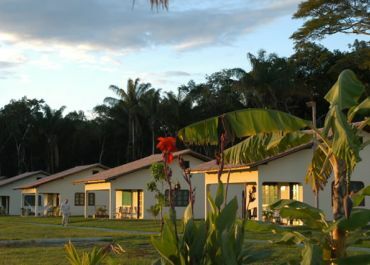 The Agua Boa Amazon Lodge was built in 2001. The lodge is a spacious facility with a large dining room, a living room, bar and game room. The game room has a snooker table, ping pong table, darts and an endless array of games from chess to backgammon. There is also an entertainment area with a DVD player, and satellite TV. The lodge also has a great porch with an eating area, hammocks and sitting area. Outside there is a 20 meter swimming pool and bar area and a volleyball and soccer field. The Agua Boa Amazon Lodge has the finest facility in the peacock bass world. 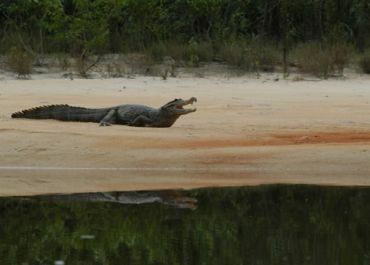 Combine the accommodations with the small capacity at the lodge and you will not find a better buy in the Amazon. Clients stay in well-furnished air-conditioned bungalows. Each bungalow has a large front and back porch, hammock and sitting area. Inside there is a main room with two double beds, a reading area, frigobar, TV, and table. The bathroom is large and well designed. A ten inch shower head will let you know that you are in the land of water. The bungalows have hot and cold running water, flushing toilets and enough storage for even the best packed fishermen. The hot water is provided by solar panels. Ready to join us at the Agua Boa Amazon Lodge?